Royal Caribbean has issued a new update to guests who are concerned about the status of San Juan, Puerto Rico in the aftermath of damage caused by the 2017 hurricane season. The cruise line reports that, "tremendous progress has been made with recovery efforts across the island," and that rebuilding tourism and consumer confidence is a top priority. The Puerto Rico Tourism Company continues to collaborate with government agencies to make strides towards a full recovery. Hotels, communities, and local organizations have focused their efforts on the restoration of tourist areas to ensure guests receive a fantastic vacation experience. Most hotels are fully operational and Luis Muñoz Marín International Airport (SJU) is fully functional welcoming domestic and international visitors. 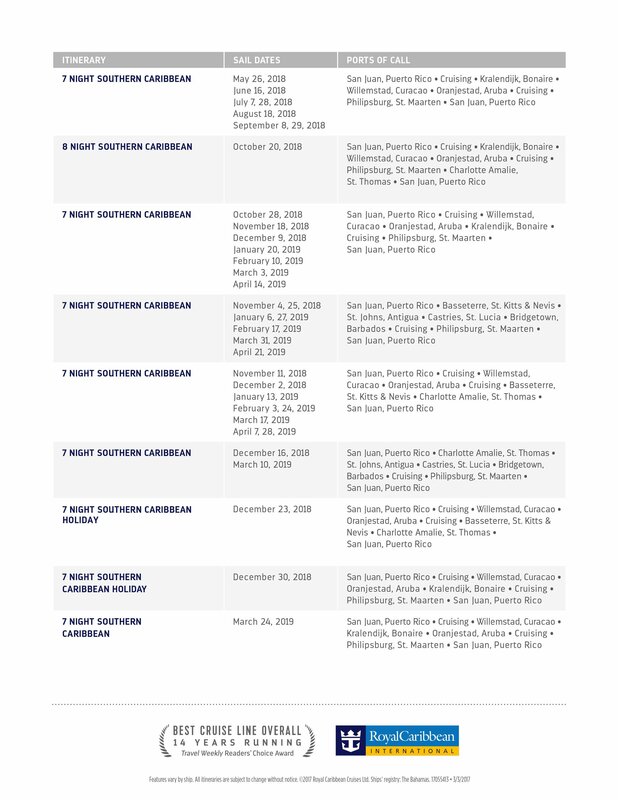 Here are some commonly asked questions regarding cruising in or out of San Juan. This information was up to date as of July 24, 2018. Is the port of San Juan open and fully functional? Yes, San Juan Harbor is open and has resumed all homeporting operations. Have airports in Puerto Rico returned to normal flight patterns? At this time, most of the hotels are available and fully operational across the island. In addition, over 4,000 restaurants and approximately 200 casinos and other tourist attractions are open. Has electrical power been restored across the island? Though some residential communities throughout Puerto Rico remain without power, San Juan has been restored and is fully operational. What attractions and/or tours are available for cruise guests to participate in? What humanitarian efforts are available should cruise guests wish to assist? Tourism plays an instrumental role in the recovery of Puerto Rico’s overall economic status, impacting local jobs and livelihood. Now more than ever, recovering Caribbean islands need you. Understandably, many guests are concerned about their upcoming Royal Caribbean cruises that leave out of San Juan, Puerto Rico, or just apprehensive about booking a cruise departing from there. The damage caused by recent hurricanes can still be felt across the island. Royal Caribbean has released a new set of frequently asked questions to address the current state of affairs in San Juan, and what guests can expect. This information was up to date as of October 30, 2017. What is the current status of Puerto Rico, more specifically the city of San Juan? Rebuilding is underway! The Puerto Rico Tourism Company has collaborated with government agencies and the private sector to provide relief following the damage caused by recent hurricanes. The safety of all visitors and residents remains a top priority as the island takes steps towards a full recovery. Airports, hotels, and cruise infrastructures are operational and are on a steady path to rebuilding an even stronger Puerto Rico. San Juan Harbor is open and has resumed homeporting operations. Luis Munoz Marin International Airport in San Juan is fully operational with scheduled domestic and international flights. Other airports in surrounding areas are operational with limited service. Have hotels reopened? Is there availability? At this time, approximately 69% of hotels are operational and accepting reservations. Availability varies by hotel and can change at any time. Roughly 70% of Puerto Rico remains without power. Are services available to safely transfer cruisers to-and-from the airport? Though transportation services remain somewhat limited, ongoing clean-up efforts and increased availability of fuel are improving the outlook. Currently, 83% of gas stations on the island are functioning. To assist in this arena, those Royal Caribbean guests arriving and departing San Juan on the embarkation and debarkation days of their cruise vacation are eligible to receive complimentary transfers from the airport to the pier and vice versa. This service will remain complimentary for Jewel of the Seas and Adventure of the Seas guests traveling through December 31, 2017. Specific flight parameters apply. Have cell towers and telecommunication services been restored across the island? Nearly 70% of the island’s cell phone towers and telecommunication services are working in full capacity. Guests can opt to participate in relief assistance through monetary contributions or through the donation of much-needed, essential supplies. For many of these recovering islands, tourism plays an instrumental role in their overall economic status, impacting local jobs and livelihood. Now more than ever, these impacted islands need you! Governor Ricardo Rosselló, along with the executive director of the Ports Authority, Lic. Omar Marrero Díaz, announced Thursday improvements to San Juan's Pan American II Pier, in partnership with the Royal Caribbean Cruises Ltd. The announcement comes as Royal Caribbean announced its intention to homeport Freedom of the Seas in San Juan in May 2018. To do this, investments will be made in this port facility to optimize the infrastructure and in turn improve the experience of the passengers at the dock. As part of the agreement between Royal Caribbean Cruises Ltd. and the Ports Authority, a number of works will be carried out including: improvements to the boarding bridge, improvements and reconfiguration of safety checkpoints, adding passenger registration desks, The capacity of the baggage inspection area, improvements to the bathrooms, dredging to the dock area of ​​the Pan American Wharf II, improvements to the mooring structure of the ships and other miscellaneous improvements to the building. The economic impact is expected to be momentous and have an increase in Ports Authority revenues of $2.8 million. For fiscal year 2015-2016 Royal Caribbean Cruises Ltd. brought a total of 574,140 passengers and is expected to increase to approximately 700,000 passengers by 2018. Royal Caribbean's Freedom of the Seas will call San Juan, Puerto Rico its new home in 2018-2019. 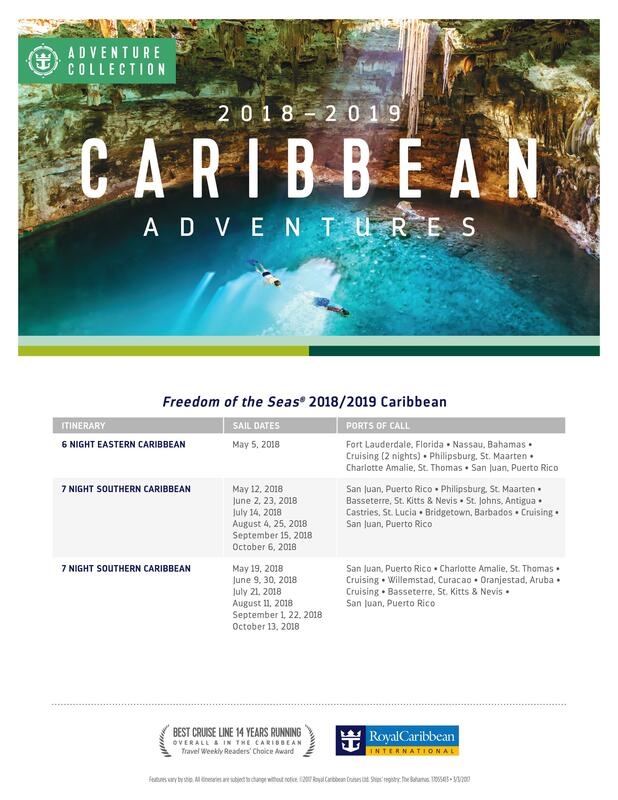 The cruise line's 2018-2019 Caribbean deployment has a number of 7-night Southern Caribbean cruises that will sail round trip from San Juan. Freedom of the Seas will depart her current home of Port Everglades, Florida on May 5, 2018 and reposition to San Juan at the end of that sailing. From then, through March 2019, Freedom of the Seas will homeport from San Juan. Freedom of the Seas will replace Adventure of the Seas, which will be moving to Cape Liberty, New Jersey. Thanks to Erik Clauson aka Cruiseboy for discovering the deployment plans. Exploring a port of call's history can be just as interesting and fun as spalshing at the beach or enjoying local cuisine. In Old San Juan, Puerto Rico, history comes in spades and among the most popular historical spots tourists can see are the two old Spanish forts that guard the city, Castillo San Felipe del Morro (El Morro) and San Cristóbal. These two forts are among the most popular historical sites to see in Old San Juan, and they offer an intriguing look back at the island's rich history as well as provide amazing views of the surrounding area. 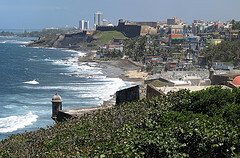 The two Spanish forts are located on the north side of Old San Juan, and are within walking distance of each other. El Morro is the more famous of the two forts, as it guards the entrance to the harbor, while San Cristóbal was built to defend the city itself. The city of San Juan provides a free shuttle from the cruise area up to the forts, although the distance is walkable by most people and there is a lot to see and do along the way. Starting with El Morro, the fort is set opposite a rather large grassy area, where you will often spot locals and tourists flying kits, taking dogs for walks and otherwise enjoying the wide open space. Like San Cristóbal, once inside the fort, guests are able to tour the fort on their own and explore every aspect of it. The park staff do offer guided tours at certain times that narrate the experience. Nonetheless, you should feel free to explore the fort on your own, as there is plenty of signs to help tell the fort's story. There are many areas of the fort to explore, as El Morro is rather large and offers views of the entrance to the harbor, the ocean and the surrounding areas. Admission to El Morro gets you admission to San Cristóbal as well (and vice versa). After a walk to San Cristóbal, you will find a fort similar in nature to El Morro, but this fort offers better views of the city and harbor. San Cristóbal was built to defend the city against land based attacks and is larger than El Morro. In fact, it is the largest fortification built by the Spanish in the New World. Like El Morro, San Cristóbal provides a self-guided tour of the facility and there are plenty of nooks and crannies to explore. If your Royal Caribbean ship happens to be in port during the evening, El Morro is lit up quite nicely and provides even more beautiful photo opportunities. The two Old San Juan forts are among the most famous historical sites in Old San Juan and they are to Old San Juan what the Statue of Liberty might be to New York City. There are two good tips we can offer for seeing the forts: try to go there early in the day before the temperatures rise and take the complimentary trolley from the cruise ship terminal. Since Puerto Rico is in the tropics, it tends to get quite hot and humid in the afternoon, especially between the months of March through November. Given that the fort is almost entirely outdoors, ideally you will visit it in the morning before it gets too hot outside. If you are wondering about which fort to see if you only have time or energy for one, El Morro tends to be the better choice for its photo opportunities and slightly smaller footprint. Keep in mind that admission to one fort gets you into both (for up to 7 days), so there is no financial reason not to see both. Be sure to bring your cameras to either fort, because the views offered are really quite impressive. Cost: $7 per adult. Children 15 and under are free. Old San Juan, Puerto Rico is a popular cruise port because of it's close proximity to the United States and ample cultural and relaxing activities to choose from. If you're looking to explore Old San Juan and get a taste of the city without paying for a formal excursion or guide, there are a lot of great places to see that are walking distance from your cruise ship. We visited Old San Juan on a recent cruise aboard Royal Caribbean's Quantum of the Seas and had a full afternoon and evening in the city to take it all in. What I love about Old San Juan is how easy it is to explore without fear of getting hopelessly lost. Since Old San Juan is on a hill, it's fairly easy to get your bearings at any time. While there are plenty of excursions available in the surrounding San Juan area, I really like walking around the city to see the many sights (and smells) that are mere minutes from your cruise ship. When you dock in Old San Juan, you will be let out in the heart of the city and that means you can walk to most everything available. It is recommended to bring good walking shoes and appropriate clothing for a hot and humid environment. With San Juan's many hills, temperatures regularly over 80 degrees and lack of natural shade, walking around will definitely burn some calories. Let's take a look at my picks for things to do in Old San Juan, Puerto Rico. Perhaps the best known tourist attractions in Old San Juan are the two old Spanish forts that used to guard entrance to the city, Castillo San Felipe del Morro and Castillo de San Cristóbal. Both of these forts are on the northern coast of the city and both are United States National Parks. There is not much to do to prepare to see these forts, you just walk in, pay the admission and then take as much time as you like to explore. What is amazing about these forts is they give you a very good sense of what life was like for the Spanish troops guarding these fortified positions. If you take the time to visit the exhibits, you will see the kind of threats Spain faced and tales of when foreign powers tested the Spanish resolve to defend the city. In addition, the views of the city and ocean are unparalleled and you absolutely need to bring your camera here to take some great shots. Admission to one fort gets you admission to the other fort for up to 7 days, so if you have time you can visit both. The popular theory these days is El Morro is the more interesting and distinguished of the two forts, so you have time for just one, go with El Morro. The San Juan Gate is the only remaining city gate and was one of six original massive wooden doors that centuries ago allowed passage into San Juan. All the gates except for this one remain, and it's a bright red with a Latin inscription at the top that says, "Benedictus qui venit in nomine domini" (blessed is he who comes in the name of the Lord). Besides being an important piece of San Juan's history, it's located along the Paseo del Morro, which is a 3/4 mile walkway that follows the city wall below El Morro. It's impressive to see the city walls that at one time controlled complete access to the city and with its location right on the harbor, it's a beautiful spot to enjoy a walk. The path to and from the gate are quintessentially old San Juan. Once again, there's little shade here so bring water for the walk and some sunscreen. 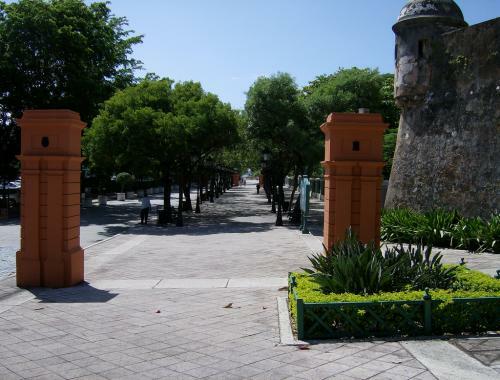 Access to the San Juan Gate is free and you can walk here anytime during the day. Located near El Morro is the Paseo de la Princesa, a beautiful area between where your cruise ship docks and the San Juan Gate. The Paseo was originally built in 1853 and has been restored quite beautifully in recent years. It's essentially a tree-lined promenade that is great for walking, people watching or enjoying the breeze. You will also find local street vendors and artisans selling local food and crafts as well. There are great examples of art to be found here as well. If you are thirsty, try a shaved-ice topped with your choice of flavoring known as piragua. For something more filling try alcapurria, Bacalito or Empanadilla’s. Old San Juan is all about history, including the spot where the Pina Colada was invented, a small restaurant known as Barrachina. Barrachina is located right in the middle of Old San Juan and it offers a lot of Puerto Rican cuisine, including the original Pina Colada. While you are indulging in some coconut spirits, you should also have another Puerto Rican specialty: mofongo. Mofongo is mashed plantains that are usually topped with a meat like shrimp, steak, chicken or octopus and drizzled with a special sauce. It's hard to describe what mofongo tastes like except that it is quite good and something I always order when I am on the island. You can certainly try a pina colada or mofongo pretty much anywhere and everywhere in Old San Juan, but for a bit of history (and somewhere to sit down and rest after all that walking), Barrachina is a great spot. I usually do not try to visit cemeteries but the colonial-era cemetary near El Morro is a pretty interesting spot. Located outside the walls of El Morro, the cemetary is a famous landmark and is the final resting spot for many prominent residents of Old San Juan. Actors, poets, politicians, artists and more are all buried here and the layout of the graveyard is fairly impressive. Since I do not particularly care for walking all around the cemetary, you can get a great view of it from El Morro and the area surrounding it so you can get a sense of the spectacle the cemetery is without going inside. If you are lucky enough to be in Old San Juan at night, the city transforms after the sun goes down. Nearly all the sights we mentioned already in this post and others are lit up in the evening and it gives them all a very different look that has to be appreciated even if you just visited them a few hours earlier. The city does a wonderful job of lighting up the city, so be sure to give yourself time to walk around at night and bring your camera too. Where are your favorite places and things to do in Old San Juan? Which of these would you most like to see for yourself? Any questions? Share these and any thoughts you have in the comments! Puerto Rico's Governor announced plans to expand the cruise pier in Old San Juan to be able to handle cruise ships carrying 6,000 passengers. The plan according to Alejandro Garcia Padilla will be able to accomodate Royal Caribbean's Quantum of the Seas, which will visit San Juan in December 2014, with nine more visits scheduled for 2015. The new pier expansion will cost $8.7 million and will extend the pier by 182 feet as well as build a new baggage inspection office. Quantum of the Seas will be 167,000 tons and carry at least 4,180 passengers when she begins sailings in November 2014.